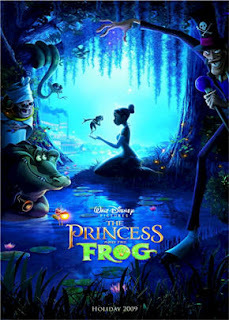 The Princess and the Frog is an American animated family film loosely based on E.D. Baker's novel The Frog Princess, which was in turn inspired by the Grimm brothers' fairy tale "The Frog Prince". It is the 49th animated feature in the Walt Disney Animated Classics line, and the first of these films to be traditionally (2D) animated since 2004's Home on the Range. The film was directed by John Musker and Ron Clements, directors of The Great Mouse Detective, The Little Mermaid, Aladdin, Hercules, and Treasure Planet, with songs and score composed by Randy Newman and featuring the voices of Anika Noni Rose (as Princess Tiana), Oprah Winfrey, Keith David, Jim Cummings, John Goodman, Jenifer Lewis, Bruno Campos, Michael-Leon Wooley, Peter Bartlett and Terrence Howard.The movie opens with the evening star shining above New Orleans. Young Tiana (voiced by Elizabeth Dampier) and Charlotte La Bouff (voiced by Breanna Brooks) are listening to the story of "The Frog Prince" as told by Tiana's mother Eudora (voiced by Oprah Winfrey). Charlotte is thrilled with the idea of finding a prince, while Tiana vows she will never need to. Instead she shares a dream with her father James (voiced by Terrence Howard): to open a restaurant of their own. Years pass and Tiana (voiced by Anika Noni Rose) is now working as a waitress, skimping and saving, and seems to have let go of having fun in favor of her dream, as her father has now passed on. She finally makes the money and shows the plans for her restaurant to her mother, who insists that she needs to look at other parts of life and that even though her father never got what he wanted, he had what he needed: love. Meanwhile, Prince Naveen (voiced by Bruno Campos) arrives in the city with his butler Lawrence (voiced by Peter Bartlett). The prince has been cut off by his parents for his play-boy lifestyle and either has to marry or get a job to support himself. He plans to wed Charlotte (voiced by Jennifer Cody) to gain her fortune. The two soon meet up with Doctor Facilier (voiced by Keith David), a voodoo magician jealous of the La Bouff fortune, who turns Naveen into a frog and gets Lawrence to join him in his plot to rule New Orleans. At the La Bouff grand ball, Tiana learns that another client put down a higher offer on the building she wanted for her restaurant, and is now left with nothing unless she can top him by Wednesday. 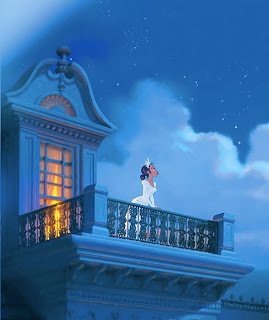 Having given up hope, she desperately wishes on a star, when frog Naveen appears. Thinking her a princess, he convinces her to kiss him in order to break the curse, but the spell backfires and she becomes a frog as well. The two are chased out as Lawrence uses a voodoo charm to impersonate the prince and win the heart of Charlotte. It requires Naveen's blood however, so Facilier sends out his voodoo spirits to retrieve the prince, who has escaped to the bayou with Tiana. He plans to get Charlotte's money, kill her father Big Daddy La Bouff, and take over New Orleans, feeding the souls of the citizens to his voodoo friends.In the bayou, Tiana and Naveen encounter Louis (voiced by Michael-Leon Wooley), an alligator who wants to be a jazz musician, and Ray (voiced by Jim Cummings), a Cajun firefly who is in love with a star he has named Evangeline. They take them to see Mama Odie, the good voodoo priestess of the swamp. Along the way, Naveen falls in love with Tiana. They eventually reach Mama Odie (voiced by Jenifer Lewis), who insists they need to dig deeper to get what they want. Naveen realizes this means being with Tiana. Mama Odie reveals that for the two to become human, Naveen must kiss Charlotte, who is the Mardi Gras Princess. Naveen plans on proposing to Tiana, but she shows more interest in her dream than in him and he thinks she does not reciprocate his feelings. He decides to marry Charlotte and give Tiana her money so Tiana can open her restaurant. However, he is kidnapped by the voodoo spirits. Meanwhile, Ray reveals to Tiana that Naveen truly loves her. Tiana rushes to the Mardi Gras parade to find Lawrence marrying Charlotte in the Naveen disguise, having re-fueled the voodoo charm. Brokenhearted, she runs to the graveyard and tells Ray that Evangeline is just a star and he will never actually meet her. Ray rushes off and manages to free the real Prince Naveen and steal the charm, causing Lawrence to resume his true form and become arrested. He gives it to Tiana just before Facilier crushes him. Facilier offers Tiana her restaurant, as well as her human form back, but Tiana realizes that love and following her heart is more important than taking the easy way, like her father had said. She shatters Facilier's charm, releasing the voodoo spirits from within who proceed to drag a screaming Facilier into their world for failing them. 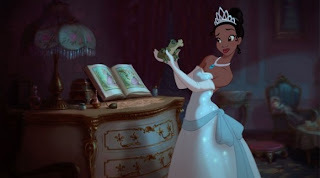 Back at the Mardi Gras parade, Naveen offers Charlotte marriage, but Tiana confesses she'd rather have him as a frog than have her restaurant because she is in love with him. Charlotte offers to kiss him so he can marry Tiana, but it is too late. Mardi Gras is over and Charlotte is no longer a princess. Louis finds a mortally wounded Ray and rushes him to the pair. He gets to see them together and happy before he dies. At Ray's funeral, they look up and see that another star has appeared next to Evangeline. 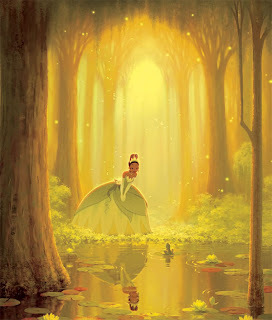 Naveen and Tiana are married in the bayou by Mama Odie. Their kiss turns them back into humans because Tiana is now a princess married to royalty. The two go back home and get back the building by having Louis threaten the real estate agents. They work together and open Tiana's restaurant, where Louis plays trumpet in his band. The movie ends with them kissing as the evening stars, Ray and Evangeline, twinkle from above.